As the number one of the most trusted brand in online and mobile payments, PayPal has recently released the newest version of its Android app. The latest version of PayPal Android app, version 2.8, has been designed to include a couple of features which have been existing on PayPal for iPhone app, such as ability to add money from check issued in the US simply by scanning the check image with PayPal app, and store application on Android’s removable SD card. The inclusion of check scanning feature means that Android users can now also deposit and transfer the check though their phone. Send money as a gift, split the bill or repay to friend for free. 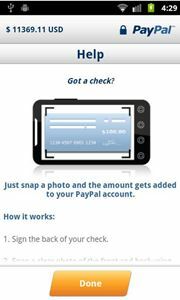 Add money to PayPal account by snapping a photo of check. Check balance, withdraw money or view past transactions directly from Android phone. Search the businesses nearby that accept PayPal as payment via PayPal local feature. Supports SD card to improve application performance. Snap a clear photo of front and back directly from Android phone. Then, enter the Check amount and tap on the “Process Check” button to proceed with the deposit process. After that, PayPal will verify and send a confirmation to user once completed. According to PayPal, it may take up to six days to process and clear the deposit and users have to keep the check for at least 15 days. PayPal Android app is available as a free download at Android market.